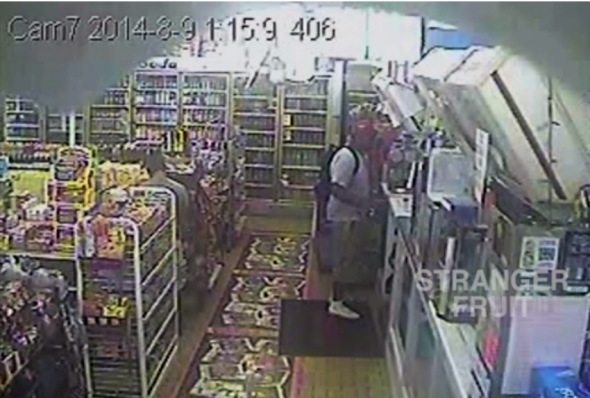 New video footage shows Michael Brown may not have robbed Ferguson store. Michael Brown at Ferguson Market and Liquor in new footage. A previously unreleased video sheds new light on the final hours of Michael Brown, the 18-year-old shot and killed by police in Ferguson, Missouri, in August 2014. The surveillance video is unrelated to the police stop that resulted in Officer Darren Wilson shooting and killing Brown. The newly released footage from a security camera at Ferguson Market and Liquor does, however, add insight to a video released shortly after Brown’s death that appeared to show Brown physically manhandling workers at the convenience store and stealing cigarillos shortly before his fatal altercation with Wilson later that day. Residents and protesters in Ferguson were angered by the police department’s decision to release the original footage of Brown in the convenience store, believing it was an effort to portray the 18-year-old in an unflattering, potentially violent light in order to help justify Wilson’s use of force shortly after. The just-released footage taken in the same store is part of the documentary Strange Fruit that debuted at South by Southwest in Austin, Texas, over the weekend. The footage shows Brown going to the store around 1 a.m. on Aug. 9, 2014, the day he was shot, and appears to add context to Brown’s relationship with the store clerks and his interactions with them 12 hours later. Jason Pollock, a documentary filmmaker who acquired the new tape, says the footage challenges the police narrative that Mr. Brown committed a strong-armed robbery when he returned to the store around noon that day. Instead, Mr. Pollock believes that the new video shows Mr. Brown giving a small bag of marijuana to store employees and receiving cigarillos in return as part of a negotiated deal. Mr. Pollock said Mr. Brown left the cigarillos behind the counter for safekeeping … But Jay Kanzler, a lawyer for the convenience store and its employees, strongly disputes that version of events, and said the new footage is unrelated to Mr. Brown’s later visit to the store. It’s unclear why the footage wasn’t part of the discussion at the time of the shooting. St. Louis County Police Chief Jon Belmar told the St. Louis Post-Dispatch on Saturday it was “news to me” that Brown was in the convenience store earlier in the day. The St. Louis County Police Department’s report on the case, however, made mention of the previously unreleased video. “Sgt. Shawn McGuire, a spokesman for the county police, said in an email on Saturday that footage of the earlier encounter had not been released because it was not relevant to the investigation,” the Times reports.